The use of remotely piloted aircraft systems (RPAS) for civil applications is a new perspective in the field of natural hazard phenomena. The amazing diffusion of mini- and micro-RPAS is becoming a valuable alternative to the traditional monitoring and surveying applications, opening new interesting viewpoints. The acquisition of high-resolution remotely sensed data from RPAS in areas characterized by hazardous natural processes can be a powerful instrument to quickly assess the damages and to plan effective rescues without any risk for operators. The main goal of these systems is the collection of different data (e.g. images, gas or radioactivity concentrations, etc.) and the delivery of various products (e.g. 3-D models, hazard maps, high-resolution ortho-images, etc.). The high repeatability of RPAS flights and their limited costs also allows for a multi-temporal analysis of an area. However, methodologies, best practices, advantages, and limitations of these kinds of applications are unclear and/or poorly shared by the scientific community. This special issue aims at exploring the open research issues and possible applications of RPAS in the field of monitoring and management of geo-hazards to collect experiences, case studies, and results, as well as to define methodologies and best practices for their effective use in geo-hazard contexts such as landslides, floods, earthquakes, and volcanic areas. Papers dealing with the integration of heterogeneous sensors (gas sensor, multi-spectral and thermal images, lidar, vision-based navigation systems, etc.) for innovative applications in the geo-hazard domain will be particularly encouraged. We present a method for acquiring very-high-resolution images for 3-D mapping of gullies over kilometre-square areas using kites. Kites used in appropriate conditions can be an advantageous alternative to light unmanned aircraft when local regulations or weather conditions hamper their use. We proved that kites can acquire images, allowing for high-quality 3-D coverage of large areas. We automatically detected and mapped gullies from a decimetre kite DEM with 74 % accuracy of the length. 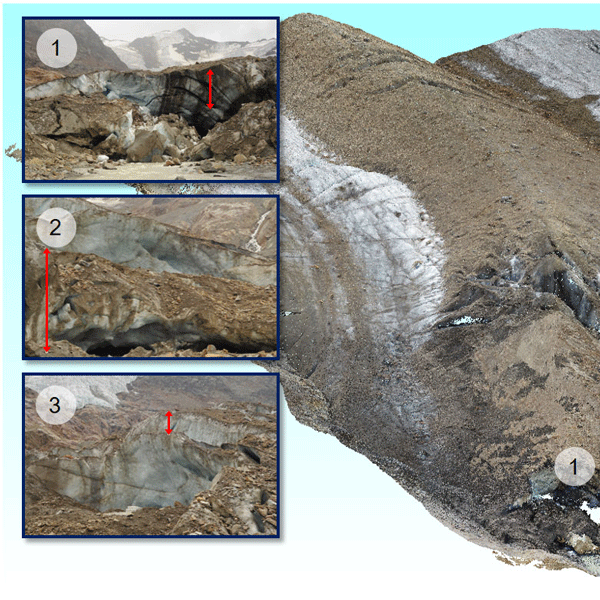 This paper describes the surveys we performed in 2014 and 2016 by means of UAVs and terrestrial photogrammetry to monitor the Forni Glacier, one of the largest glaciers in the Italian Alps. We investigated the hazards related to the glacier collapse, which have been increasing recently due to the high ice melting rate. Our approach is feasible and low cost and we will repeatedly monitor the glacier to provide rapid hazard detection services to help the tourism sector. To better settle the location and quantify the activity of the Hengchun Fault, we integrate UAS for geomorphologic data acquisitions, photograph and morphotectonic interpretation. Then PS-InSAR results, validated with GPS and leveling data, allow characterizing and quantifying the surface displacements. We confirm the geometry, characterization and quantification of the active sinistral transpressive Hengchun fault. The potential hazards are worthy of further investigation. Several remote sensing techniques, i.e., aerial photographs, drone images, and airborne lidar, were used in this study to decipher the morphological features of obscure landslides in volcanic regions and how the observed features may be used for understanding landslide occurrence, subsequent geomorphological evolution, and potential hazards. Two large-scale landslides were characterized and quantified in this study. Remotely Piloted Aircraft System was used for the engineering geological investigation of a marble mine area in Italy. High resolution images were processed by using SfM techniques for obtaining an accurate and detailed three-dimensional model of the area. Geological and geometrical information was used for a preliminary stability analysis with focus on investigating the contribution of potential rock bridges of two large blocks that pose a potential hazard issue for the workforce. Unmanned aerial vehicles can provide digital elevation models and orthomosaics of high spatio-temporal resolution to enable landslide monitoring. The study examines the additional value that morphological attribute of openness can provide to surface deformation combining with image-cross-correlation functions alongside DEM differencing. The paper demonstrates the automated quantification of a landslide's motion over time with implications for the wider interpretation of landslide kinematics. Unmanned aerial vehicles are widely used in the emergency investigations of major natural hazards in a large area, but less commonly for single geo-hazards. Based on a number of successful practices in the Three Gorges Reservoir area, China, a complete UAV-based emergency investigation method of single geo-hazards is concluded. It can not only greatly reduce the time, strength and risks, but can also provide high-accuracy, high-definition valuable information to support emergency responses. 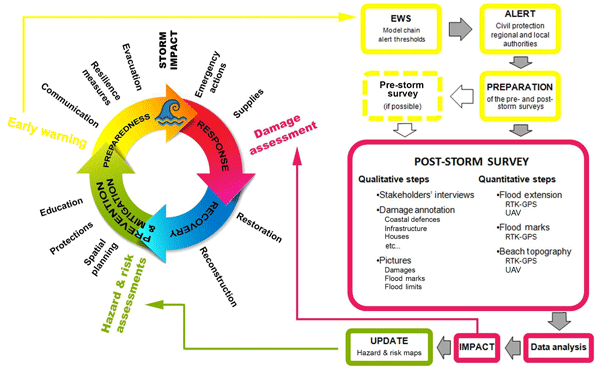 Immediately after an earthquake it is crucial to perform the fastest recognition of the damaged area to rescue as much people is possible and to assess and map the damage scenario. We apply the vehicle routing problem (VRP) to a fleet of unmanned aerial vehicles (UAVs) to find the shortest routes and the best take-off sites. The simulation, performed with different autonomy ranges, is carried out in the town of Acireale (Italy), where a real-time accelerometric network has been installed.